Turin (Italian: Torino; Piedmontese: Turin pronounced [tyɾ'in]) is a major industrial city as well as a business and cultural centre in northern Italy, capital of the Piedmont region, located mainly on the west bank of the Po River. 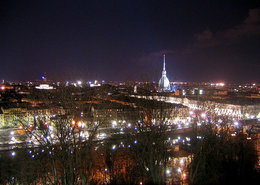 The population of the city of Turin is 908,000 (2004 census); its agglomeration totals about 1.7 million inhabitants, while its metropolitan area has a population of 2.2 million of inhabitants (according to the OECD). The company Fiat automobile manufacturer has its headquarters here, so Turin has been nicknamed as the Automobile Capital of Italy. It was the first capital of the unified Italy. The Italian name, Torino, translates as "little bull"; hence the coat of arms and the symbol of the city. The area was settled by the Taurini in pre-Roman times. 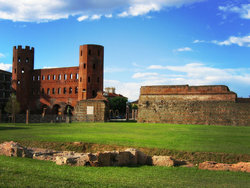 In the first century BC (probably 28 BC), the Romans created a military camp (Castra Taurinorum), later dedicated to Augustus (Augusta Taurinorum). The typical Roman street grid can still be seen in the modern city. Turin reached about 5,000 inhabitants at the time, all living inside the high walls. After the fall of the Roman empire the city was conquered by the Lombards, then the Franks of Charlemagne (773); in the 940s the Contea di Torino (or countship) was founded, until 1050 held by the Arudinic dynasty and then, after the marriage of Adelaide of Susa with Humbert Biancamano's son Otto, by the family of the Counts of Savoy. While the dignity of count was held by the Bishop as count of Turin (1092-1130 and 1136-1191) it was ruled as a prince-bishopric by the Bishops. In 1230-1235 it was a lordship under the Marquess of Montferrat, styled Lord of Turin. At the end of the thirteenth century, when it was annexed to the Duchy of Savoy, the city already had 20,000 inhabitants. Many of the gardens and palaces were built in the fifteenth century when the city was redesigned. The University was also founded during this period. Emanuele Filiberto (Iron Head) made Turin the capital of the Duchy of Savoy in 1563. Piazza Reale, today named Piazza San Carlo and Via Nuova, today called Via Roma were added with the first enlargement of the walls, in the first half of the XVII century; in the same period the Royal palace (Palazzo Reale) was built. In the second half of that century, a second enlargement of the walls was planned and executed, with the building of the arcaded Via Po, connecting diagonally through the regular street grid Piazza Castello with the bridge on the Po. In 1706, during the Battle of Turin, the French besieged the city for 117 days without conquering it. After the subsequent Treaty of Utrecht, the Kingdom of Sardinia was annexed to the Duchy of Savoy and the architect Filippo Juvarra began a major redesign of the city. Now the capital of a European kingdom, Turin had about 90,000 inhabitants at the time. In the nineteenth century, after brief occupation by Napoleon, the city began to actively pursue the unification of Italy. In 1871, the Fréjus Tunnel was opened, making Turin an important communication node. The city now had 250,000 inhabitants. The Museo Egizio, the Mole Antonelliana, the Gran Madre church and Vittorio Veneto square were built in this period. 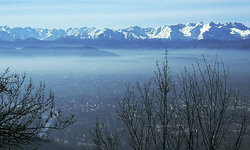 View over Turin and Alps. 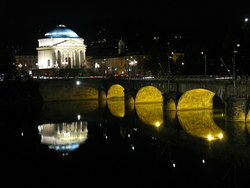 In 1861, Turin became the capital of the newly proclaimed United Italy. In 1864 the capital was moved to Florence. (Since 8 July 1871, the capital has been Rome.) Turin reacted to the loss of importance by beginning a rapid industrialisation: in 1899 FIAT was founded and Lancia in 1906. The Universal Exposition held in Turin in 1902 is often considered the pinnacle of Art Nouveau design, and the city hosted the Exposition again in 1911. By this time, Turin had grown to 430,000 inhabitants. After World War I, conflicts between workers and industrialists began. The first strikes took place and in 1920 the Lingotto factory was occupied. After World War II, Turin was rapidly rebuilt and its industries greatly developed, which caused waves of immigration, largely from the southern regions of Italy. The population reached 1 million in 1960 and peaked at 1.5 million in 1975. In the 1980s, the first industrial crisis hit the city and its population began to decline (and continues to, while the metropolitan area grows). The 2005 population is 908,000. The mayor of Turin is directly elected every five years. Sergio Chiamparino, the current mayor, belongs to the center-left coalition. Turin shares its municipality in 10 districts. Municipal Districts does not correspond always to historical Districts of the city. In the following list are listed historical Districts (named Circocrizioni) included in Municipal districts. Turin is located in northwest Italy. It is surrounded on the western and northern front by the Alps and on the southern front by the hills of Monferrato. Four major rivers pass through the city: the Po and two of its tributaries, the Dora Riparia (later changed to "Duria Minor" by the Romans, from the Celtic duria meaning "water"), the Stura di Lanzo, and the Sangone. Turin has a truly continental climate, with nothing to share with the rest of Italy which is famous for its comfortable Mediterranean climate. Winters are cold and dry, summers are cool in the hills and quite hot in the plains. During the winter and autumn months banks of fog, which are sometimes very thick, form in the plains. In 2005, Turin city proper had a population of 902,255 up from 867,857 (+3.82 increase), while the metropolitan area contained a total 2,236,941 inhabitants. Like many cities in Italy, the population is highly aged as 14.5 percent of the population is under 18, while those of retirement age constitute 30.12 percent. Despite this, the population of Turin grew mostly from internal migrants from other areas of Italy, as well as an increasing amount of foreigners particularly from Eastern Europe. The city has seen a large influx of foreigners over the last few decades comprising just under 9 percent of the city's population consisted of foreigners, the largest being Romanian (23,114), Moroccan (14,134), Peruvian (5,502), Albanian (4,297), and Chinese (3,533). Today the city is a major industrial center, where the headquarters and main production lines of the car company Fiat are located. The city is home to the Lingotto building, which was at one time the largest car factory in the world, and now houses a convention centre, a concert hall, an art gallery, a shopping centre and a hotel. Other companies founded in Turin are Lancia, Pininfarina, Bertone, Sparco, Italdesign, Ghia, Fioravanti, Stola, Intesa Sanpaolo, Superga, Invicta (1821), Lavazza, Martini & Rossi, Kappa and the chocolate factory Caffarel. The city is also well known for its aerospace industry (Alenia). The Multi-Purpose Logistics Modules for the International Space Station were produced in Turin. The future European launcher projects beyond Ariane 5 will also be managed from Turin, by the new NGL company, a subsidiary of EADS (70%) and Finmeccanica (30%). 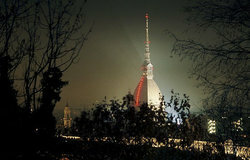 Turin is also the birthplace of some of the country's main companies, such as Telecom Italia (telecommunications), Rai (television), and cinema. 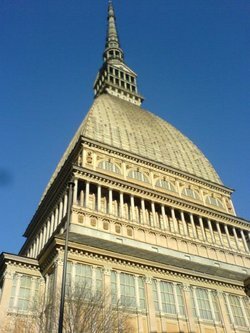 Most of these industries have since moved their headquarters to other parts of Italy, but Turin still retains the National Museum of Cinema (in the Mole Antonelliana building). The town currently has a large number of rail and road work sites. Although this activity has increased as a result of the 2006 Winter Olympics, parts of it had long been planned. Some of the work sites deal with general roadworks to improve traffic flow, such as underpasses and flyovers, but two projects are of major importance and will change the shape of the town radically. One is the Spina ("spine") which includes the doubling of a major railroad crossing the town. The railroad previously ran in a trench, which will now be covered by a major boulevard. The town rail station on this line will become the main station of Turin (Porta Susa). The other major project is the construction of a subway line based on the VAL system, known as Metrotorino. This project is expected to continue for years and to cover a larger part of the town, but its first phase was finished in time for the Olympic Games (inaugurated on 4 February 2006 and opened to the public the day after). The first leg of the subway system linked the nearby town of Collegno with the Porta Susa station in Turin's town centre; a new leg (inaugurated on 4 of October 2007) extends now the service to the 'Porta Nuova' railway station. This underground transportation project has historical importance for Turin, as the town has dreamed of an underground line for decades, the first project dating as far back as the twenties. In fact, the main street in the town centre (Via Roma) runs atop a tunnel built during the fascist era (when Via Roma was built). The tunnel was supposed to host the underground line but is now used as an underground car park. A project to build an underground system was ready in the seventies, with government funding for it and for similar projects in Milan and Rome; whilst the other two cities went ahead with the projects, Turin local government led by mayor Diego Novelli shelved the proposal as it believed it to be too costly and unnecessary, but that only meant more funding for Rome and Milan. The city has an international airport known as Caselle International Airport Sandro Pertini (TRN), located few kilometres from downtown and connected to the city by a railway service (from Dora Station) and a bus service (from Porta Nuova and Porta Susa railway stations). 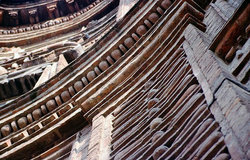 The Palatine Towers (old photo). The Palatine Towers nowadays, Archaeological Park. 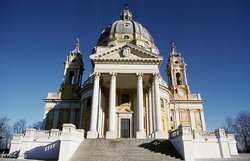 The Basilica di Superga near Turin. The façade of Palazzo Carignano. The Gran Madre Church from the Mole Antonelliana. The Gran Madre Church at night. The best known building of the city is the Mole Antonelliana, whose construction began in 1863 and which today houses the National Cinema Museum. 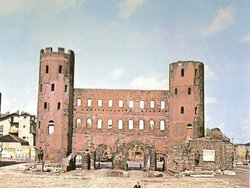 The Palatine Towers are among the best preserved Roman remains in northern Italy. The Cathedral of St John the Baptist houses the Shroud of Turin, an old linen cloth with an imprint of a man, which is believed by many to be the cloth that covered Jesus in his grave. Nearby is the former royal residence: the seventeenth-century Palazzo Reale, built for Madama Reale Christine Marie of France. The Museo Egizio has the most important collection of Egyptian antiquities in the world after the Cairo Museum. Turin has buildings of great historical and architectural interest: the Savoy Residences. In addition to the Royal Palace (the official residence of the Savoys until 1865) there are many palaces, residences and castles in the city centre and in the surrounding towns. Turin is home to Palazzo Chiablese, the Royal Armoury, the Royal Library, Palazzo Madama, Palazzo Carignano, Villa della Regina, and the Valentino Castle. The complex of the Residences of the Royal House of Savoy in Turin and in the nearby cities of Rivoli, Moncalieri, Venaria, Agliè, Racconigi, Stupinigi, Pollenzo and Govone was declared in 1997 a World Heritage Sites by UNESCO. In the hills overlooking the city is the basilica church of Superga, providing a view of Turin against a backdrop of the snow-capped Alps. The basilica holds the tombs of many of the dukes of Savoy, as well as many of the kings of Sardinia. Superga can be reached by means of the Superga Rack Railway from the suburb of Sassi. The city was the film set of the 1969 film The Italian Job and Deep Red (1975), directed by Italian horror filmmaker Dario Argento. 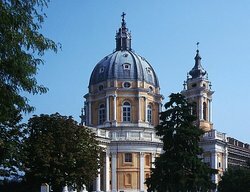 After Alexandria, Madrid, New Delhi, Antwerp and Montreal, Turin has been chosen by UNESCO as World Book Capital for the year 2006. The International Book Fair is one of the most important fairs of its kind in Europe. Turin is home to one of Italy’s principal national newspapers, La Stampa, and to the sports daily Tuttosport. 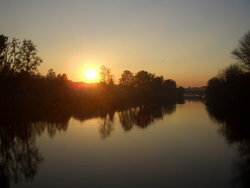 Turin was the city where the FISA (international rowing federation) was born in 1892. The city is famous for two very successful football teams: Juventus F.C. (founded 1897), and Torino F.C. (founded 1906). Juventus F.C. is a very popular football club in Italy Template:Fact, and historically one of the most prestigious and glorious football clubs in the world, having won a total of 51 official trophies: 40 in Italian tournaments and 11 in the international competitions, Only Boca Juniors -with 16 titles- and other three clubs: Independiente, Real Madrid and Milan -all with 15 titles- have won more official international titles in the world.</ref> all recognized by Union of European Football Association and International Federation of Association Football. In 1949, a plane carrying the whole Torino F.C. team (at that time the most important in Italy and known as the Grande Torino) hit the church of Superga, on the Turin hills. Valentino Mazzola (one of the best Italian players of all times), father of Ferruccio and Sandro Mazzola (who were later to become football champions) were among those who died. Turin was the host of the 2006 Winter Olympics. The C.U.S. Torino volleyball team won 4 times the domestic league and, in season 1979/80 the Volleyball European Champion's Cup. It was the first team from western Europe to win this competition. In the 1990s, the team had been dismantled due to economical issues. Turin is the birth place of solid chocolate. It was in Turin that, at the end of the 18th century, Mr. Doret invented a revolutionary machine that could make solid chocolate (as opposed to drinking chocolate). Turin chocolate firms produce a typical chocolate, called Gianduiotto, named after Gianduja, a local Commedia dell'arte mask; plus many other kinds of chocolate. Every year the town organizes CioccolaTÒ, a two-week chocolate festival run with the main Piedmontese chocolate producers, such as Venchi and others, as well as some big international companies, such as Lindt & Sprüngli. 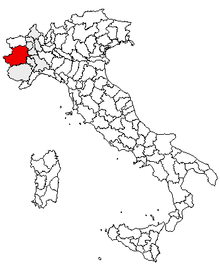 Turin is surrounded by several smaller cities in the Province of Turin such as Grugliasco, Rivoli, Chivasso, Venaria, Settimo Torinese, Orbassano, Moncalieri, Avigliana, Buttigliera Alta, Gassino Torinese, Nichelino, Collegno, Pino Torinese, Chieri, Ciriè, Ivrea, Pinerolo, Borgaretto and others, that make up one of Italy's primary metropolitan areas. Giovanni Agnelli (1866-1945), founder of FIAT. Gianni Agnelli (1921-2003), influential chairman director of FIAT. Fred Buscaglione (1921-1960), singer and songwriter. Giuseppe Marc'Antonio Baretti (1719-1789), critic. Norberto Bobbio (1909-2004), historian and philosopher. Carla Bruni (born 1968), supermodel. Pierre Paul Caffarel (1795-1850), founder of the first chocolate factory in the world. Antonio Benedetto Carpano (1764-1815), inventor of vermouth and apéritif. Leo Chiosso (1920-2006), lyricist, songwriter with Fred Buscaglione. Galileo Ferraris (1847-1897), physicist and electrical engineer. Joseph Louis Lagrange (1736-1813), mathematician. Vincenzo Lancia (1881-1937), sportsman and businessman, founder of Lancia. Luigi Lavazza (1859-1949), inventor and coffee businessman. Carlo Levi (1902-1975), painter and writer. Primo Levi (1919-1987), chemist, philosopher, Holocaust survivor and writer. Salvador Edward Luria (1912-1991), winner of the Nobel Prize in Physiology or Medicine. Alessandro Martini (1812-1905), vermouth businessman. Carlo Mollino (1905-1973), architect and designer. Rita Levi-Montalcini (1909), winner of the Nobel Prize in Physiology or Medicine. Aurelio Peccei (1908-1984), founder of the Club of Rome. Massimo Taparelli, marquis d'Azeglio (1798-1866), statesman, novelist and painter. Victor Emmanuel II of Italy (1820-1878), King of Piedmont and the first King of the united Italy. Turismo Torino The official tourist guide, available in English, Italian, French, Spanish and German. Turin 2006 Olympic Games — English, Italian and French. Website version is in Italian. Winter Universiade Torino 2007 — English, Italian and French. Website Version is Italian. National Cinema Museum of Italy.